A bore is a fellow who opens his mouth and puts his feats in it. I think that much of the advice given to young men about saving money is wrong. I never saved a cent until I was forty years old. I invested in myself - in study, in mastering my tools, in preparation. Many a man who is putting a few dollars a week into the bank would do much better to put it into himself. All Fords are exactly alike, but no two men are just alike. Every new life is a new thing under the sun; there has never been anything just like it before, never will be again. A young man ought to get that idea about himself; he should look for the single spark of individuality that makes him different from other folks, and develop that for all he is worth. Society and schools may try to iron it out of him; their tendency is to put it all in the same mold, but I say don't let that spark be lost; it is your only real claim to importance. 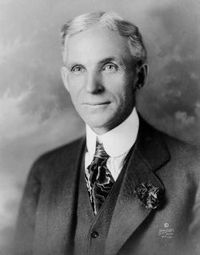 18 quotes by Henry Ford.